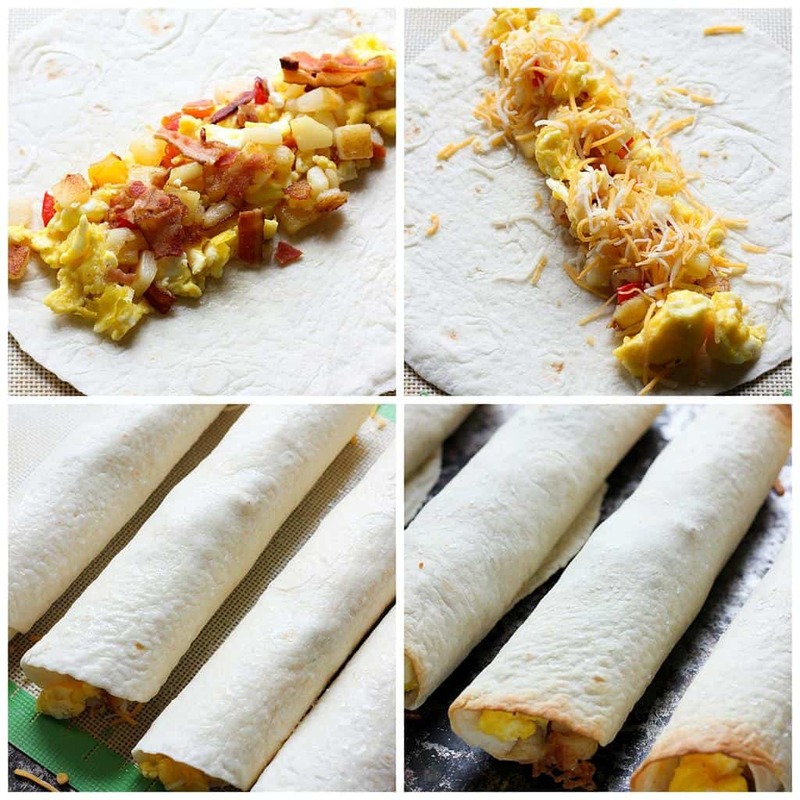 Breakfast Taquitos are so easy to customize. Fill with your favorite meat, veggies and cheese. Add scrambled eggs and you’ve got a delicious breakfast! Well hello there! Mandy from Mandy’s Recipe Box here. I have a great breakfast recipe for you. 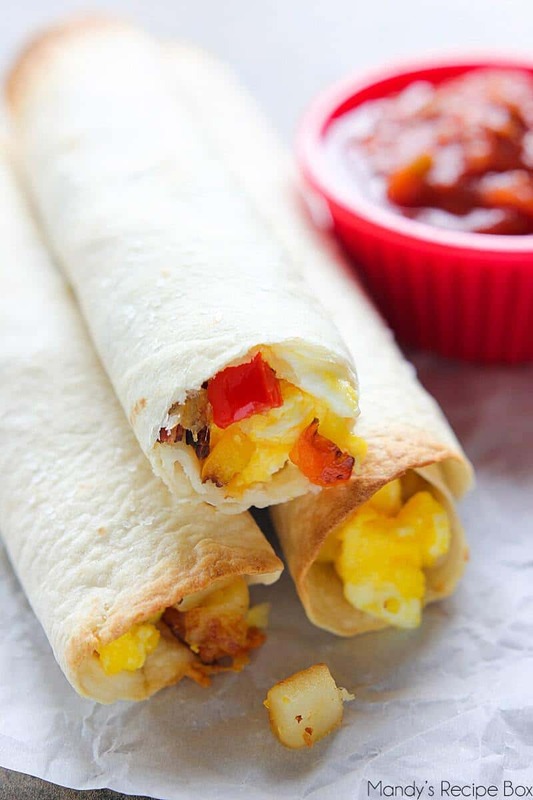 These Breakfast Taquitos are like a breakfast burrito only skinnier and baked in the oven to finish. They have a crispy outside and delicious filling inside. They are baked not fried so you won’t have a lot grease hanging around guilting you out. I used bacon (duh), colorful bell peppers, frozen cubed potatoes and a Mexican cheese blend with my scrambled eggs. 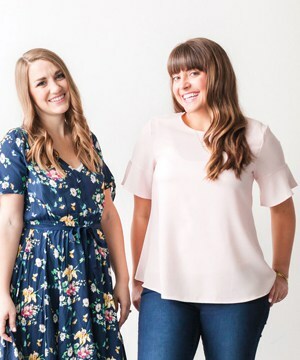 You can change it up so many different ways. After filling the tortillas, roll them up and brush or spray with olive oil. Sprinkle on some coarse salt and bake. Dip them in your favorite salsa for extra delish factor. You could freeze these as well. Just bake and cool, then place into freezer bags. To reheat just pop them in the microwave or oven for about 20 minutes until hot. 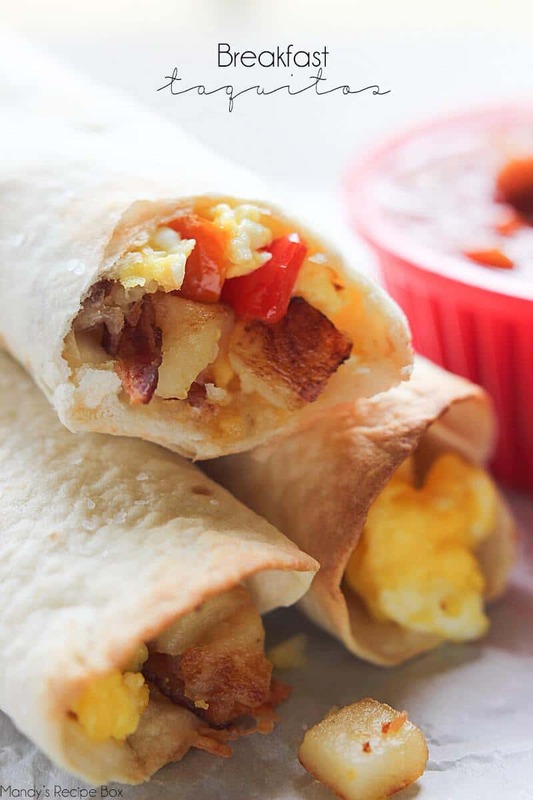 Make a bunch to have on hand for mornings before school or in the summer. WINNER. Cook bacon in a skillet. Once crisp, remove from skillet. Cook potatoes and peppers in the bacon drippings until done. Meanwhile, scramble eggs in another skillet. Once cooked, add to potato mixture and stir to combine. Heat tortillas in the microwave to make them pliable. Divide mixture among tortillas. Add cheese to all. Roll up tightly and place seam side down on baking sheet. Brush or spray with olive oil and sprinkle salt over taquitos. Bake at 425 degrees F 15 minutes. 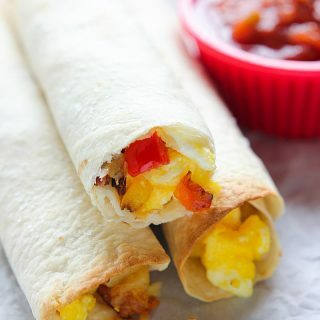 This looks delicious, in my house we love tacos or burritos so I will be trying this yummy breakfast out.